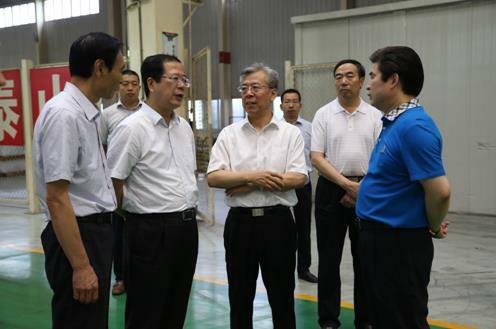 On July 14, Mr. Li Zhengyin, the head of provincial transportation department, accompanied by the acting mayor Mr. Chen Zhenliang and other municipal officers, formally paid an one-day working visit to Dayun Motor Company, aiming to study and research corporation development. Mr. Yuan Qinshan, the chairman of Dayun Motor Group, Mr. Sun Zhaoming and Mr. Wu Defeng extended the warmest welcome to Mr. Li Zhengyin and other delegates. Mr. Yuan introduced to the guests Dayun Motor's history and the present development, also invited them for an in-depth visit to workshops. With great interests, Mr. Li and other government officers went into welding workshop, punching workshop, painting workshop, assembling workshop and special vehicle workshop, where they witnessed how a vehicle is produced by the designed procedures with the help of advanced robots. During the visit, Mr. Li additionally put questions about new energy vehicle regarding R&D, production and sales. After the visit, Mr. Li gave encouraging and affirmative remarks to Dayun Motor’s achievement, pointing out Dayun Motor seized the best opportunity to manufacture commercial vehicle and made the current achievement which displayed Dayun Motor’s sensitiveness to market. Dayun Motor initiatively engaging in new energy vehicle project has great significance to accelerate provincial economy by pushing the development of new energy industry. Provincial transportation department, Mr. Li said, will continue to provide with active service in the field of transportation and logistics, solving problems timely to keep enterprises in sustainable development.